Below you shall find PDF files scanned by Wx4 and generous contributors, as well as links to some (but not nearly all) rule books that can be found elsewhere. Wx4 invites you forward your rule book scans for placement on this page. American Railroads underwent tremendous technological changes during the first part of the Twentieth Century on a level not seen before, or since. This collection of known online Standard Codes of the period serves as a chronicle of how these changes affected operations. The 1938 Code, courtesy of Jon Habegger, gives us excellent comparative illumination of how the old rules held up over time. 1906 Standard Cipher Code - Internet Archive - 751 pages!!! The following scans are courtesy Jon Harbegger. 1983 SP operating rules (updated from 1978 edition), "the Blue Book" - Wx4 - This was my personal copy from my early career that is marked up with arrows and sidenotes, an indication of how confusing and perplexing the rules could be to a young railroader. The following are Wx4 scans, except as noted. Kid, you've got to learn the rules so you'll know which ones you're violating. - SP engineer of unrecalled identity speaking to author one night in 1978. Southern Pacific Rule 108: In the case of doubt or uncertainty, the safe course must be taken. Southern Pacific (unofficial) Rule 108-A (circa 1980): When in danger, or in doubt, run around and scream and shout. During railroading's first days, there likely were very few, if any, written rules, since railroad rules - the operating ones, anyway - have traditionally come into being in the remedial wake of some disaster or another. Since railways were a totally new technology, nobody could thoroughly predict what potential calamities lay ahead when something new was introduced. In those early times, "the rules" were more spur-of-the-moment, word-of-mouth sendoffs of conventional wisdom, "Good luck boys! Don't forget to slow down for curves - you remember what happened last week - and, for God's sake, stay sober." This arrangement was fine until it was time to complicate things with a second train. This opened the can of worms, because getting multiple trains around each other turned out to be the most complicated part of railroading. Some outfits tried operation by "smoke signals", whereby two opposing trains simply looked out for each other. On a clear day, when the birds were singing, this was all well and good, but on a dark, gloomy day, especially when a crew had been amply warming itself with liquid consumables, certain flaws became crushingly apparent. Timetables, the original rules references in print, theoretically cured the problem of unexpected encounters by posting schedules for trains to be respected by each other. Later, timetables began to show specific meeting points, and the resultant frequency of inordinately long waits in sidings quickly brought on a realization of just how breakdown-prone trains actually were. Timetables were consequently amended with various codicils addressing what to do in these situations - most of them helpful, homely instructions, roughly akin to, "Should your train break down on Bull Hill, secure the use of a good horse (not a mule!) to ride out and alert the other train to proceed." Those sorts of rules were generally effective (and their class survives today in the form of special rules or instructions particular to specific locations) as long as railroads were no longer than a convenient horse ride. But as lines lengthened, branches were added and trains grew in size, speed and frequency, the sheer quantity of new-rules-born-of-mistakes caused some timetables to be a double-sided yard long. Boston and Providence Railroad already had 14 rules adhering to the margins of its timetables in 1835, and the essentials of several of them have survived into modern times. Just exactly when the first book of rules apart from a timetable appeared in the U. S., we don't know. About 90 years ago, Railway Age published what they maintained was the earliest rule book that they had heard of, a 3.5 x 5.5 inch booklet issued by the Western Rail Road in 1842, which included all of 13 rules within its modest 18 pages (see PDF's). This may actually not be the earliest one, but it must be close at the very least. The earliest scanned American timetable that Wx4 has located online is an 1854 example from Philadelphia, Wilmington and Baltimore. Interestingly, Wx4 has also found three rule books from 1840's English Railways online. It might be reasonable to assume that the Brits came out with books earlier than Americans, since they began running trains earlier, and their railway infrastructure was much superior to ours. Researchers of the period conclude that rule books did not come into widespread domestic use until the early 1870's, which at first seems odd, given that the great boon to railroading, telegraphic train orders, had already been in existence for two decades. Train order and associated rules would soon cause rule books to bulge, but in the meantime, railroads - being conservative and at times dunderhead institutions - were slow to adopt this revolutionary technology. Likewise many of those that did adopt train orders failed to include references to them in their books of rules or timetables, though it is fairly likely that dispatchers had published guidelines to draw upon. By the 1870's use of telegraphic train orders had become common, and a little later in the century, nearly universal. It may be that the growing complexity of the system, meaning the growing profusion of related rules may have been the precipitating cause for adopting rule books. Like train orders, rule books were nearly universal by the 1880's. Other things were happening in the latter 19th Century that expanded the rules, as well. One of them was the issue of rapidly growing train speed and size, and another, the corollary issue of braking technology, which had a disturbing propensity to remain behind-the-curve in comparison. Railroad exec's were keen to speed up trains and make them bigger, but were loathe to go to much expense to slow them down. Another factor was aging, antiquated and shoddily maintained infrastructure. This was the age of the great railroad moguls (who actually were financiers - money men - not railroaders), who were more concerned with profit extrication and stock manipulation than the condition of their properties. Consequently, by the 1880's, the nation's railroads annually hosted an appalling number of "pile-ups", and literally thousands of people died each year on the trains or along the rights-of-way. Technology, or more accurately, the improper implementation and poor maintenance thereof, by now was clearly advancing at a rate beyond any individual railroad's ability to totally keep up with its fallout. This occasioned professional organizations to come into increasing favor as means to address industry-wide issues. The Master Car Builders Association, for one, began to tighten-up equipment standards, which was a significant help, because, using today's hindsight, some equipment and appliances apparently were manufactured with the aim of causing derailments and / or injuries. 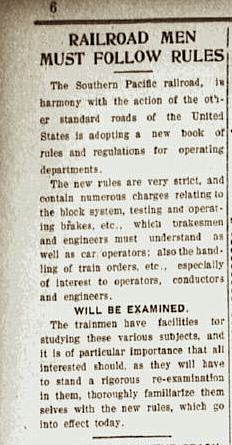 On the operating side, the American Railroad Association used its collective wisdom to come out with a Standard Code of Train Rules in 1887. This all was advisory (Federal Government's mandates were still a decade away), railroads were free to adopt the Standard Code either in bits and pieces, or as a whole, and the largest railroads generally tended to go with the former, smaller roads, the latter. Southern Pacific was a bit schizophrenic in its reaction to the new code. SP's Atlantic Lines adopted it, while the Pacific lines, as best as can be determined, continued to forsake the book of operating rules concept until at least the early 1890's. The Standard Code, along with later competing Consolidated Code (Northwestern railroads) and Uniform Code (Midwest Railroads), had a good run. It only was replaced en masse by the succeeding General Code of Operating Rules in 1985. Several roads instead decided to opt out and formed the Northeast Operating Rules Advisory Committee (NORAC), which came out with its own version of the rules two years later. Since then, the Federal government has gradually and abundantly insinuated itself into "the rules", generally for the better, through the Code of Federal Regulations, Part 049. Positive Train Control will likely be the central focus of rules debate in the near future, as the unforeseen consequences of unproven technology collide head-on with the real world. That's the way it's always been. An interesting and somewhat less light-hearted rules history entitled "Early Rules and the Standard Code" appeared in the October, 1939 issue (no. 50) of The Railway and Historical Society Bulletin. It is available for free online perusal at JSTOR. A nagging question: When did Southern Pacific's first rule book appear? SP Lines East adopted the Standard Code in 1887, but Lines West did not, and appeared to have continued (maybe Lines East, too?) placing the rules in timetables until the early 1890's. The first SP book that Wx4 has heard of was issued in 1898. Was this the first?